Who are exempted in taking Civil Service Exam? What are the requirements and process in acquiring Civil Service Eligibility Certificate? These are some of the most common questions being raised by interested applicants who want to become a Government employee. Having Civil Service Eligibility is one of the basic requirements in entering the Government's workplace. You can possess the said eligibility if you take the CSE or the Civil Service Examination. However, there are also exemptions on the examination. Those people who are eligible are just advised to go to the nearest CSC Regional Office to inquire about the requirements in obtaining the certification. Summarized below are the complete exemptions to CSE professional and subprofessional eligibility exams. The services must be voluntary, meaning, the BHW has not been employed and has not received any form of salary, or compensation, except honorarium, in the entirety of the five-year period for service requirement. The services rendered must be continuous for a minimum period of five (5) years, meaning, the BHW should have served actively and satisfactorily on a full time basis. The services rendered shall be under accredited status of the BHW, meaning, the applicant-BHW should already had been accredited by the Local Health Board before rendering the five-year service requirement. BHW who had been hired by agency under Job Order status and/or Contract of Service, may still avail of/qualify for the grant of BHWE. Pursuant to the Presidential Decree No. 1569, it says that the Barangay Nutrition Scholars shall be granted to Barangay-based volunteer workers for rendering at least 2 years of continuous and satisfactory nutrition services and other related activities such as community health, environmental sanitation, culture, mental feeding and family planning. Barangay officials are granted CSC eligibility pursuant to Republic Act No. 7160 also known as the Local Government Code of 1991. The applicant shall be specialized in the following fields of study. If the applicant is not in the list of eligibles, he/she may still apply for examination and be granted with CSC eligibility. CSC is administering these exams twice yearly. All information posted above are courtesy of the PRCBoard and Civil Service Commission. This article has been made for dissemination purposes only. Should you have further clarification, I recommend to call them at their hotline or visit their nearest Regional Office for further details. 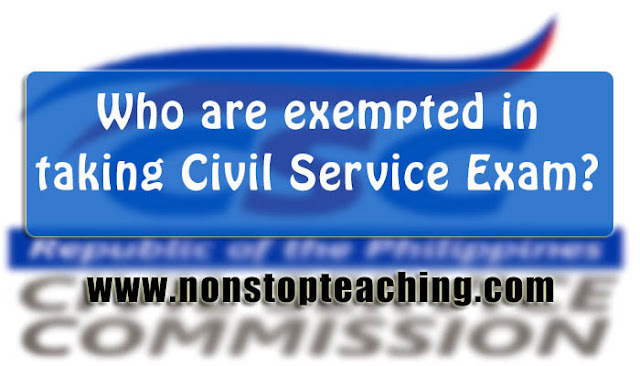 Who are exempted in taking the Civil Service Exam? The complete list of exemptions. Board passers, Brgy. Health Workers, Brgy. Nutrition Scholars, Brgy. Officials, EDP Specialists, Honor Graduates, Sanggunian Members, SAT Specialists.